We are fortunate to live in a country that has embraced laws that not only promotes freedom of expression, but encourages people to make use of the public land that has been set aside for individual citizens to set up example of their core principles and beliefs — and for groups to set up examples of their mission and purpose. Free Speech Zones are designated in front of state and federal buildings, parks and strips of land controlled by the National Park Service. Free Speech Zones are intended to serve every citizen equally all year long. Free Speech Zones, however, have been claimed by the religious community as areas that are set aside for their use only. This declaration has gone on for far too long. The fact that America is not a Judeo-Christian country is overshadowed by the prominence of winter displays such as giant menorahs and life-size crèches. Too often in America, the minority nontheist community completely disappears during the winter season. I say that if the nontheist community says nothing and does nothing — they will be treated like they are nothing. Imagine for just a moment that you are a Christian or a Jew. As you walk by a Free Speech Zone, you see the giant menorah and a life-size crèche. It is empowering to witness a religious display that exemplifies your philosophy. Now imagine taking the same path as a nontheist. A public display of a menorah and a crèche only serves to reinstate the fact that as a nontheist, your views and your community are invisible. What can be done about it was a question that some nontheist groups have tackled for many years. It is the goal of the FS in participating in a Free Speech Zone to not show a great deal of hostility towards Christianity. Members of FS should not seek to demean a belief that the religious community holds dear. Just as we do not want our philosophy trashed, we must discourage any display that attacks a sacred religious symbol. Without a place to exercise freedom of expression, there would be no designated area to hold rallies, protests, and programs to promote education and awareness of issues that would otherwise go un-noticed. That is why I’ve enjoyed setting up booths and visiting the rally sites of the ACLU and other like-minded groups. Without a Free Speech Zone we are condemned to reach only those who happen to see our literature. We are also condemned to not be seen in an area that needs a counter voice. FS is proud to participate in the Free Speech Zone located at the Chester Country Courthouse. 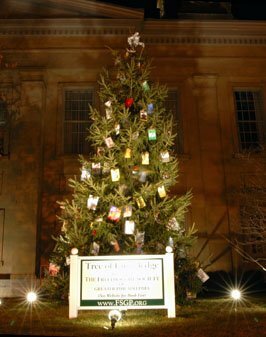 Each year since 2007, FS has installed a Tree of Knowledge for three years at the Chester County Courthouse Free Speech Zone. Should FS requests/applications to participate in any Free Speech Zone is rejected, FS is ready to file legal grievances. FS has a working relationship with the American Civil Liberties Union and attorneys from the American Humanist Association and the Freedom From Religion Foundation. We have an obligation as nontheist citizens to participate in as many free speech zones as possible. UPDATE: Please see our newsletter from January/February 2011 for an update on the 2010 Tree of Knowledge, which was not permitted to be erected.